V.Ships manages various vessel types including tankers, dry bulk carriers, gas and chemical carriers, containerships, cruise ships, and offshore vessels, and will now promote the use of the KVH service to its customers through SeaCom Electronics, a fellow member of V.Group, V.Ships' parent company. SeaCom will handle installation and technical support for the service, with support from KVH's key account manager, Niels Reuther, from the KVH EMEA headquarters in Denmark. 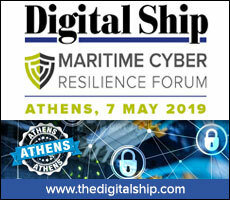 "Connecting ships with onshore networks offers exciting new ways to bring ship and shore-based operations closer together, to improve efficiencies, to manage operating expenses, and in general make a better onboard life for officers and crew," said Stephen MacFarlane, information systems director at V.Ships. "We plan to use the mini-VSAT Broadband network to deliver navigational, safety, and real time weather data, offer internet cafe and VoIP calling to help further enhance crew morale, enable onshore technical experts to collaborate on repairs with their colleagues at sea, and to connect ships to onshore networks using 'ShipSure', our enterprise resource planning software developed by V.Ships." The KVH system was selected after it was evaluated by SeaCom on more than a dozen of its managed vessels, according to Neil Sayce, SeaCom managing director. "The small, relatively lightweight antennas are much easier to place, do not require a crane, and can offer a greater choice in finding a clear location to minimise obstructions by the ship's superstructure," he said. 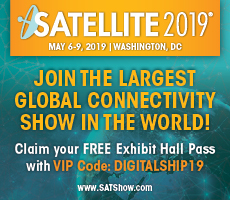 The mini-VSAT Broadband service operates on a web of 14 Ku-band satellite transponders, which can be extended with overlaid coverage from three global C-band transponders for the V11 service to cover 95 per cent of the Earth's surface. The system operates using spread spectrum technology on antennas starting from 37 cm for the Ku-band service and from 1 metre for the combined C/Ku-band coverage. "We have created a truly next generation maritime broadband system, designed from the ground up to deliver fast, high quality VSAT service on a global basis, covering 95 per cent of the Earth, including all of the world's shipping lanes," said Svend Larsen, managing director of KVH's European operations. "Our spread spectrum technology is fast and reliable, and has very low latency, making it extremely well suited for running networked applications. We are delighted to be working with V.Ships, one of the world's leading and most innovative ship management companies to bring next generation broadband services to their customers' vessels." KVH says that it is now working with V.Ships in making presentations to V.Ships customers to introduce them to the mini-VSAT Broadband service. Container shipping giant Seaspan has completed implementation of the KVH mini-VSAT Broadband connectivity for all 107 managed vessels in its global containership fleet. KVH Industries has introduced the TracPhone V11-HTS, a super-fast 1 metre Ku/C-band maritime VSAT antenna, designed to deliver data speeds up to 20 Mbps down/3 Mbps to commercial maritime vessels and superyachts. 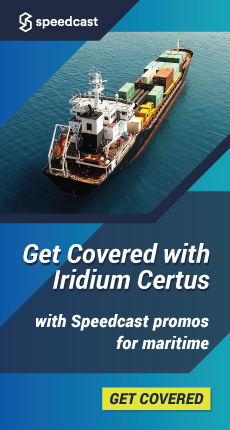 KVH Industries has extended its mini-VSAT Broadbandsm HTS network to cover the Pacific Ocean via the Horizons 3e satellite, which is jointly owned by Intelsat and SKY Perfect JSAT. A collaboration between KVH Videotel and The Nautical Institute (NI) has resulted in more than 100 NI members enrolling in online courses to further their knowledge and skills across a range of topics including ECDIS, cybersecurity, the Maritime Labour Convention for ship masters, enclosed space entry and marine environmental awareness. 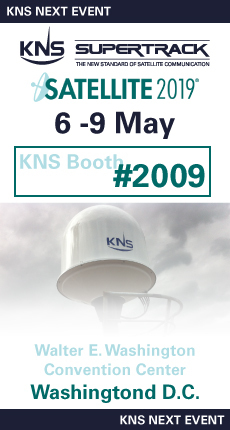 KVH Industries has shipped its 9,000th mini-VSAT Broadband system, marking the ever-growing demand for connectivity on-board ships and at sea.